Inspired by Washingtonian Magazine’s “Best Places to Live” on their May 2012 edition, here is a compilation of our “Best places to live in Fairfax County” – broken down by high school boundaries. The downside of living in a small town is that homes are smaller and/or more expensive. For many people, living in the suburbs gives them the opportunity of living in a bigger home, with a big back yard that they’ve been dreaming of – without breaking the bank. Also among the suburban category, there are boundaries with direct access to bodies of water. 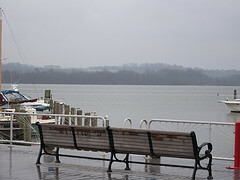 Fairfax County is surrounded by the Potomac River on the North and East side, plus there are several small lakes scattered throughout the County. The Potomac River and the lakes give water lovers access to fishing, boating, and even kayaking. For some people, having a reasonable commute to work is critical. For this, we’ve assembled a list of the best school boundaries for commuting to DC. 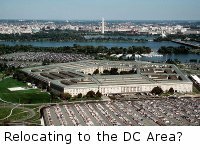 Let’s face it: commuting to Washignton DC can be a challenge. The good news is that living in one of these school boundaries can make the commute shorter and perhaps a little faster due to access to rail or to their proximity to Washington, DC. Again, the downside of easy access to the Metro is that housing can be more expensive than in other areas. But, the good news is that there are other boundaries which are centrally located and also within easy access to the major thoroughfares. These boundaries can be a good choice for people not commuting to DC. Stuart HS Along Rt. 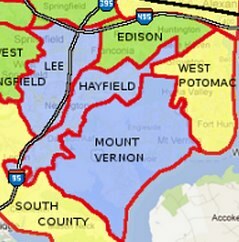 7 and next to Arlington Co.
What about the best boundaries with the “best schools”? We didn’t create a category based on “best schools” because choosing a school is a matter of personal preference: Are scores most important? Are special programs most important? That depends on your needs. And we want to help you find YOUR best school. That’s why we put together “How to Choose the Right School”, which is the first download in “The No-Tears Guide to Moving to Fairfax”. If you already have it, you might want to review it. If you don’t have it yet, go ahead and get it here. It’s free! We hope that you have found this list of school boundaries categorized by lifestyle useful. Whether you are a fan of small towns, suburbs, water-access, commuting, accessible location, or value, Fairfax County has the right home for you. Log in to the Fairfax County School Boundaries Map and find more details about your favorite school boundary: maps, area info, school scores, and housing information.